Welcome to the site on Tornados! At this time, I would like to dedicate the theme of this site to my favorite weatherman, Bob Gregory, retired from WTHR13 Indianapolis, In. He has been a famous local weather newscaster as far as I can remember. Watching him broadcast weather newscasts over the years, I admire his thorough coverage of pending severe weather and how we can protect ourselves in serious, dangerous weather. My interest in weather started by simply growing up in Indiana. Indiana experiences changeable weather. In the winter, several days may be experiencing sub zero temperatures, and suddenly it is in record breaking temperatures of the seventies. You never know what type of weather will be moving in from one day to the next! 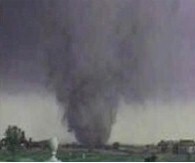 Over the years, I have experienced blizzards, severe lightening storms, and tornadoes. 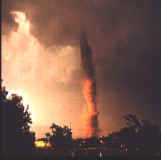 This site is on the weather phenomenon, tornadoes which scientist have only theories on how they develop.